Following our very successful ‘Past, Present & Future’ gathering in April 2015, we are delighted to announce a second gathering for all friends of Swindon Panel on Saturday 11 March 2017, and you’re invited! This time our meeting will be hosted in the panel room at Didcot, with, we hope, an at least partially-working panel for everyone to play with. Everyone is welcome, and we particularly encourage former Swindon Panel staff to join us and catch up with each other and the panel. The panel opens at 2pm, so feel free to arrive any time from then onwards. There will be a display of old Swindon Panel photos and artefacts, as well as some light refreshments. There will also, of course, be plenty of opportunity to catch up with former colleagues and chat about what people have been up to since you last saw them and what the railway has been up to (lots! ), and the preservation of the panel. At 6pm we will leave the Panel and travel to The Ladygrove pub/restaurant in Didcot, where we will enjoy a drink and those who wish to may enjoy food. A minibus transport service will be laid on from the Railway Centre to The Ladygrove and back for pre-booked passengers (there is no cost for this but please book your place on it with us in advance). You are welcome to attend the panel, or the drinks, or both, we would love you see you for whenever part of the event you can make. Wives, husbands, partners, friends and guests all welcome. Everyone is invited, and we are particularly keen to extend our invite to as many former Swindon signalmen / signallers, S&T staff, inspectors, and those who had a personal involvement with Swindon Panel as we can. So if you are one of any of the above, please do come and join us. Or if you are in contact with a former Swindon person, please do let us or them know about this gathering! Anyone wishing to travel in the minibus from the station to The Ladygrove must let us know in advance so we can book the appropriate number of places. If you only wish to attend the panel, you do not need to tell us in advance, but it would be very helpful so that we can manage the ticket gates at Didcot. Fees: There is no fee to attend the event at the panel, but if you wish to take advantage of the opportunity to visit the rest of the Railway Centre you will need to purchase the appropriate entry ticket, and all guests will pay for their own drinks and/or food at The Ladygrove. We look forward to welcoming as many Swindon signalmen and families from the past and present as we can; those involved in the present preservation effort; and those with an interest in keeping Swindon Panel alive in the future. If you are one of any of the above, please come and join us! 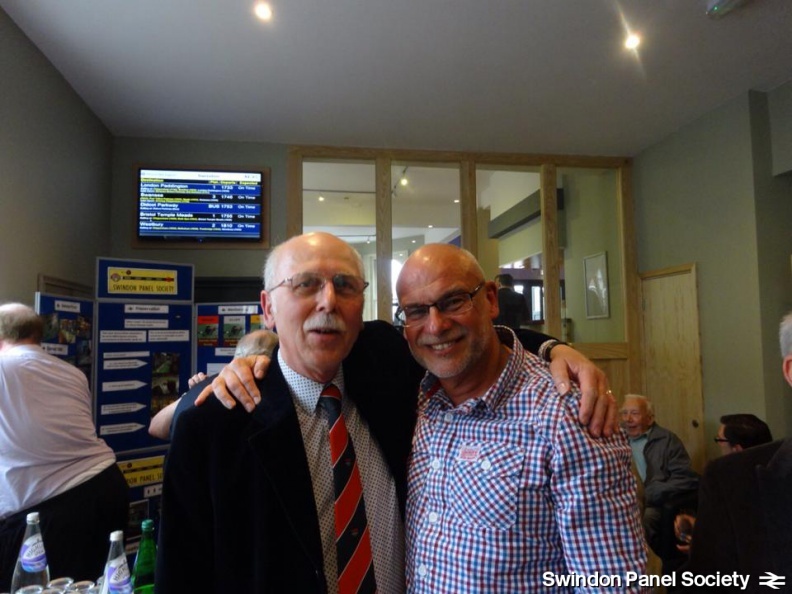 George and Steve, two well-known Swindon Panel faces reunited at our last gathering.